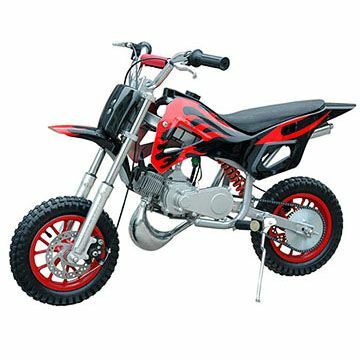 off road mini bikes, small and tiny pit bikes for you. New Riders and Off Road Mini Bikes. There are several factors to consider when deciding which makes and models of off road mini bikes to look at when your kid has no riding experience. Contrary to the popular opinion that racing in the blood is hereditary, parents may find their offspring has absolutely no interest in taking a motorized bike up and down hills and rough terrain. For that matter, they may not want to even try to ride the bike. Revving up interest can be done if the bike is similar in size to the kid. Once he or she knows their feet can set on the ground, they will be more comfortable and less nervous about trying out the bike. Age typically determines how well the child listens to advice and follows safety guidelines. Many of us tend to think of Kawasaki, Yamaha, Honda and Suzuki as expensive off road mini bikes. Then we see a Cobra X50 or Triumph and realize a Honda XR/CRF100 is not that expensive in the grand scheme. It is ideal for many different types of riders, including new ones. Learning to use the clutch gets kids ready to adjust to the bigger bikes. When your son or daughter is too big for the CRF80F, find a used 100 for them to learn how to ride the trails. It is tough enough to take the spills, yet light enough for them to right the bike, climb back on and try again. Another brand name and model to look for is Yamaha's TTR-125. Chances are you will encounter a number of bigger kids learning off road riding on this bike, as well as adults gaining experience on trails and rough country. It also has a clutch and a suitable amount of power. Encourage safety by starting new riders on a small, light bike that fits them well. Let them go slow and use their feet to negotiate a bump until they are comfortable with obstacles. In the beginning, finesse is less important than building confidence in handling off road mini bikes. Could you maneuver on a mini? Or would it be a mistake? The off road mini bikes have been closely followed by enthusiasts. The cheapness of these bikes and the compactness, are ideal for those who want the fun and excitement, but not the expense of a full sized MX bike. The mini off roader is a rugged and tough bike, which can take the punishment of most courses and even small jumps, depending on how brave you are. Another benefit is - at the end of your race, or track day you can put your mini machine in the back of a normal car, no need for trailers or hitches! The cheapness of a mini dirt bike holds great appeal for parents buying their first mini moto bike for their child. 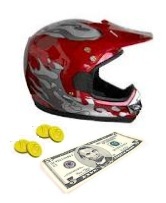 You may also want to hold back some cash for a few lessons at a motocross school. Plus don’t forget some pitbike apparel and a quality helmet for your precious one. Off road mini bikes can catch you out, when you’re starting to ride, so you'll make good use of that gear. Once you have worked out what you can afford for your bike its time to go shopping for a cheap dirtbike online. We have done our studies n' homework and give you our picks of the best off road mini bikes stores & shops out there. Ebay of course has a number of used motorcycles and motorized trail bikes for your local territories and tracks. Equipment first though – like a set of Kids Mini EVS Knee Guards for £10.99 and some cool looking Kids Impact Body Armour selling for a limited time at just £39.99. But now for complete mini bikes on ebay. 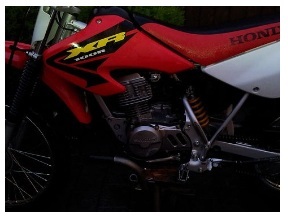 A DB Motors 50cc kids or childs pitbike (Husky Boy KTM); had 11 Bids and was standing at £281. Powered by a 50cc Morini race engine which pushes out 11bhp - (13,500rpm) it's been maintained regardless of cost – and will soak up the muddy ground. What do they have, eh? 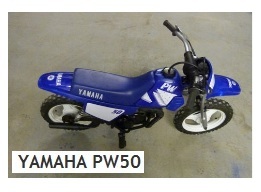 Also on ebay was a PW50 kids off road mini bikes ride up for £450.00 but when we looked no bids had been placed! This starter bike is suitable for ages 4+, but is being sold as its an unwanted present. It should be great fun at a park or a childrens circuit - or even in the back garden. Do you know where to look for a proper mini moto shop? Uk-mini-motos.co.uk is always worth a look, for a reasonable small new trail bike. We liked the look of a 49cc off roader, on sale at £114.95. Its called a HC-113, and uses the very latest in bike design and mini motor materials. You can use it as an offroad ride on the big dirt ovals or on tarmac like you would with road bikes. The HC-113 comes with a 49cc single-cylinder, two-stroke, air-cooled engine, plus a chain drive, front/rear disc brakes and a CDI two stroke ignition. For a used pocket bike you’ll be needing the help of bike-exchange.com. The ground ahead offers some great deals that wont bust your budget. A Yamaha TTR 90 came in at $1100, it has uprated Michelin starcross tires, new hand guards and a new headlight. Or would you prefer a honda (CR 85), selling for $2500? The young rider had lost interest in this dirtbike – plus its never seen any races in it's life. Finally we viewed a Bajaj DIRT RUNNER model; this 90cc was a cheap $500. Needing a brake lever it had bright green graphics and has only been ridden 3 times so is sure to be a hit. If your environment conscious, you may want to investigate the mini electric dirt bike, and the other new modern ways dirt bikes are going. Sometimes forums are a good source of free info as well. Electric bikes are not only for scooting around the carpet as toys, the motors are becoming more powerful each year and will one day perhaps even rival the gas off road mini bikes. When looking over an online store, see what they offer first; dont jump at the cheapest off road mini bikes & gear all the time. Check out all the models and ranges they have. If you’re not happy with prices; go back to the used classifieds and try there. A store is a wonderful font of knowledge, and you can browse around what’s new in the world of motocross. Plus have a look at their closeout sales and last season’s stuff for any real world bargains, you can’t do without. With all this hard earned cash you have saved, buy combinations of gear that are cost effective but still retain high quality. And if only the expensive gear is left, you can then use that saved money to buy the gear that’s required and you’d be comfortable with on the dirt circuit.